Archive: if no action/response is required from you, archive immediately. Reply: if you need to reply and it will take you less than 3 minutes, do it now. Follow this up with a nice archive obviously. Action: if an e-mail requires action from you, keep it in your inbox! That’s right, my inbox is a crucial part of my current to-do list. As soon as you’ve taken the action, reply if needed and archive afterwards. Star: reserved for special cases, where e-mails are really important to you, but require no immediate action or response. I’m not sure if this is noticeable at all, but the first three options on this list are actually kind of like a stack. The height of the action stack required for every e-mail can only be decided by you. 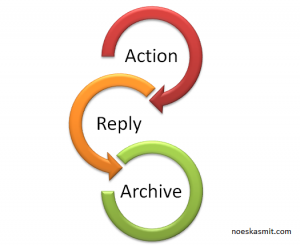 The highest action stack consists of an action-reply-archive sequence and will only be necessary for important e-mails. The second highest stack, reply-archive, occurs more frequently, but typically can be dealt with quick and painlessly. The lowest stack, which should be your option of preference, consists of quickly skimming over the e-mail and archiving immediately. The star action, I admit it’s debatable if this is actually necessary at all, is a way of keeping things that feel important close without having them in your inbox. Periodically I skim over my starred list and unstar the mails that are no longer relevant. Use templates or canned responses for basic e-mails like thank-you notes if you find yourself typing the same type of e-mails over and over again. If it’s been a while since the e-mail was sent, asking the sender if it’s still relevant can save you a lot of time. If an e-mail has been sitting in your inbox for a brutally long time, either answer it now or delete/archive it already. The rule I can never follow because I have a serious e-mail addiction problem: don’t check your e-mail continuously or have notifications when new mail arrives. For every e-mail ask yourself: What’s it to me? Is there anything required from my side? How can I handle this in the most elegant and quickest way possible? Apparently there’s an Inbox Zero book scheduled to be released at some point as well. But for now I’ll stick to my own Inbox Zero-inspired e-mail ninja routine: archive-reply-action(-star). I do this (more or less) as well, emails in my inbox still have something that I need to do. However often the action is “remember that other people need to do something and remind them if necessary”. Any idea how to deal with those? I guess in my approach, I would start those. As I regularly check my starred list, they come up and I can send them a reminder then if necessary. Always cool to see how other folks are “winning the inbox battle”. Here’s my approach which is quite similar. Cheers, Noeska. Boomerang is hands down my favorite gmail productivity tool. Definitely give it a try!